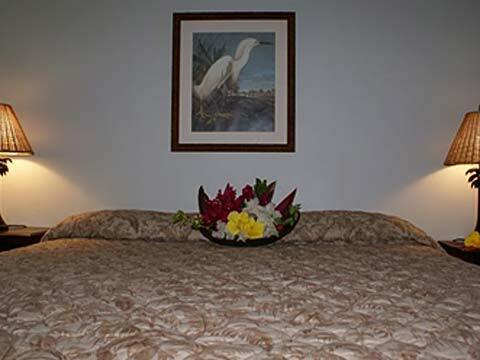 Key Largo Hotel & Resort â€“ Islamorada Hotel & Resort Tavernier Inn & Hotel, Place to Stay in Key Largo & Islamorada, Florida Welcome to the Tavernier Inn, founded in 1928. Formerly an old movie theatre, this Key Largo Hotel and Inn is one of many structures in the Upper Keys that the county has recognized as historic. The Inn encompasses a cluster of quaint pink buildings and is nestled amidst lush tropical foliage, providing a quiet, serene atmosphere in which to relax. Under new ownership and management, the Tavernier Inn has recently undergone a new wave of renovations and overall refurbishing to enhance this unique guest experience. Situated in the heart of the historic district of Tavernier, between Key Largo and Islamorada, the Inn is central to all local activities and events, as well as the famous waters of both the Atlantic Ocean and the Florida Bay. Our friendly staff is available to assist you and answer any questions you may have about planning your ideal vacation getaway. So, leave mainland Florida and enter a world of gentle breezes, coral reefs, and tropical fish where the bougainvillea and hibiscus bloom. If you are planning on vacationing in the upper keys and are looking for a Key Largo Hotel or an Islamorada Hotel, the Tavernier Inn is the perfect accommodation for you. Key West welcome you to your home away from home... where you can enjoy not only a bit of history preserved with a blend of modern conveniences, but all of the natural wonders the Fabulous Florida Keys have to offer. Find out why the Tavernier Inn is everyone's favorite Key Largo Hotel and Islamorada Hotel.